The 6th largest city in the country, formerly known as Madras, and a major city since the time of British Raj is Chennai. The city is very rich in cultural heritage, art and architecture, which add some magical charm to the place. Museums, art galleries, temples, dance shows, music concerts and many other aspects of the city make it truly worth visiting. The fascinating ancient and colonial history of Chennai is kept alive in several beautiful museums at the city. Each of them narrate various parts of Chennai's history and the influences which have been encountered with the passage of time. Here is a list of some of the best museums in the city which would attract not only history buffs but also anyone who is interested in finding out more about the past of Chennai. Built in fond memory of Kalakshetra's founder Rukmini Devi Arundale, the Rukmini Devi Museum is one of the landmark places for one to visit in the city. The exhibits here comprise of personal belongings of the danseuse and objects which were collected by her. Apart from this, one would also come across a number of gifts. Personal objects, such as sarees, a writing table, cutlery and crockery, are a major draw here. There are plenty of photographs, bronze idols and sculptures which are aesthetically arranged to aid the visitors. This wonderful repository of knowledge is one of the greatest in Chennai, when it comes to the amount of wealth and weightage of history it holds within its walls. Built in 1851, the structure is the second oldest museum in India and is a structure of historical importance, which was built in the Indo-Saracenic style of architecture. Well known for its collection of coins, currencies and medals along with the remnants from ancient Tamil culture, the museum is also home to some of the rarest and most popular paintings of Raja Ravi Varma. The complex is also a very popular joint for performing arts and houses within the much renowned Museum Theatre, which hosts theatrical and cultural events regularly. The railway system has a very long history in India which goes back to about 150 odd years. Chennai houses the headquarters of Southern Railways, hence, a visit to the Regional Railway Museum is all the more important. Spread over 6.5 acres, this campus is home to a large number of toy trains, steam engines and coaches which were built during the British Raj. One would come across trains which were used for agricultural purposes to the luxurious ones. A visit to this museum would give you a complete understanding of what trains looked like in the olden days. Facing the Marina Beach is the once majestic Ice House, which was constructed in the 19th century to store the ice which was brought from North America by a businessman Frederic Tudor. By 1880, the ice business closed and the building was restructured by a wealthy local who renamed it Castle Kernan. Things took a turn in 1897 when Swami Vivekananda stayed here for nine days after his return from the west. Renamed as Vivekanandar Illam in 1963 in his honour, the structure is now a museum which holds a permanent exhibition of his life and teachings along with some invaluable artworks from ancient India and a section which highlights Tamil Nadu's contribution to the national legacy. 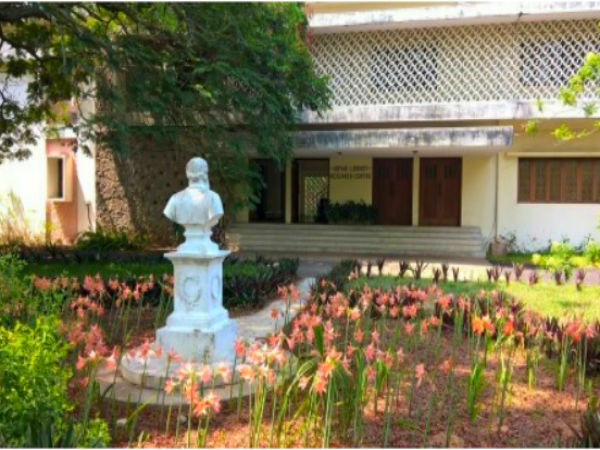 Located within the campus of the Theosophical Society in Adyar, the centre had a very humble beginning with just 200 books, which were part of founder Henry Steel Olcott's private collection. At present the place has grown to become more than just a library and houses some of the rare oriental manuscripts and books from across the globe.